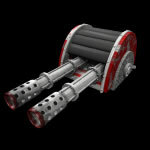 The Dual Barrel Crusader was supposed to be the go-to ballistic weapon when facing energy based weaponry. Unfortunately, its poor performance failed to impress the investors. All plans to improve the DBC are thought to be abandoned and the first and only produced batch was lost during a bandit raid on one of UF's storage facilities. Remove the apostrophe in 'its'. Otherwise, I like the idea. We'll need to play around with it to test, obviously, but seems like it could be quite fun.